Decided to give Hurry at Mackenzie a try after reading the good reviews, and boy were the bros right with the guys at Hurry performing such a great job repairing the rims! The badly kerbed one was so nicely touched up that one would not realise the imperfection unless up (very) close. Good service at very competitive pricing. Well recommended indeed. Keep up the good work guys! In fact, booking with your receptionist was a breeze and Hurry Tyre has delivered excellent customer service! Thank you very much, Hurry Tyre and Mr.Tan! Have been to major tyre shops in ubi and paya ubi area, and was quoted exorbitant prices. Went to spray painting shops and quoted high prices as well. My rims were 20" With two tone colours, which I understand requires more work than regular one coloured rims. Other than the high prices quoted by the others, they also require you to put your car overnight. Went down to Hurry at Mackenzie to get physical assessment of my rims and was served by their friendly counter staff. Quoted the range was $15-45 per rim with about 1 hour downtime. Sounds too good to be true? I set an appointment and went down the next day. 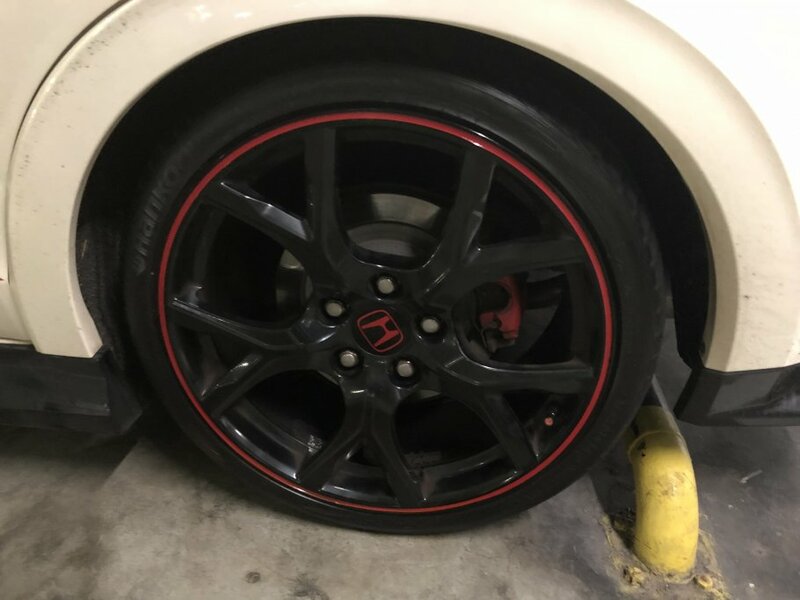 The next day, came as per appointment time, in 2 hours they repaired 4 of my 20" Rims with two tone colours with a price I least expected I'd be quoted for. Thumbs up! Went to Hurry at Bt Timah. I wasn't optimistic. I wasn't sure they could repair the damage. And if they did, I wasn't sure how expensive it would be. Long story short, Hurry fixed my rim on the spot within 20 minutes (my luck that there were no other customers), and it cost A LOT less than I expected. Best of all, they did an excellent job. When I was shown my repaired rim, they had to point out where the damage had been. The repair was that good. My only regret is I didn't take before and after photos. Fast, reasonable price, good workmanship & Polite - good service. Went to their MacKenzie branch to repair kerb rashes for all rims. Did not make an appointment beforehand, but was still served by the lady receptionist and Tristan. Tristan was friendly and obliging during discussion and the job was to repair 4x rims and install Orange TPMS for my run flats. There were some customers before my turn and i decided to leave my car with them while i left for lunch. About 2 hours later, I was informed my car was ready. I arrived and told myself not to be too fussy with the results. However, i was pleasantly surprised with their workmanship. The rims looked flawless, even on close inspection. The Orange TPMS worked well too. Got my ride on late Nov 2015 with Toyo Nanoenergy R38 Tyre. I'm aware that Toyo is good for comfort ride and fuel-efficient tyre technology but I need something for better gripping and shorter braking distance type. I went down to Hurry without making any appointment and hope to get this changed. My first choice is to change to RE003 but they do not have stock. I was recommended by Hurry why no consider Dunlop SportMaxx RT. After some introduction on Dunlop SportMaxx RT, without any doubt I opt for Dunlop SportMaxx RT. Went to their Mackenzie outlet and it was a very good experience. Helpful staff and job was done quite fast. Best of all this is the best price in the market.